This is a classic element of many midcentury styles, but it works especially well with Googie. As the post-war culture moved to explore the attractive possibilities of abstract art and space travel, geometric shapes became popular. Try covering some pillows in a reclaimed midcentury geometric pattern, or lay a foundation for your room with a vintage Ingegerd Silow rug. 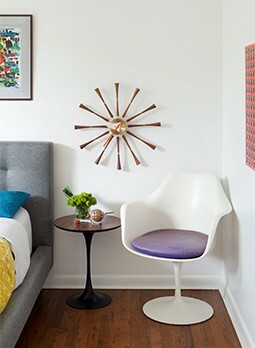 This is also the perfect time to hang a classic Nelson sunburst clock or install a coconut chair in your living room. Neil Armstrong didn’t land on the moon until 1969, but the decades leading up to that date were filled with Cold War space competition between the United States and the Soviet Union. It’s no wonder that pop culture favored entertainment such as Galaxy magazine and The Jetsons. Bring this galactic excitement to your decor through pieces such as the Aarnio bubble chair that looks like a space pod, or a lava lamp that resembles moving planets. The Googie style shouts, “Look at me!” One of the ways it does this is through bright lights and colors. The original Googie itself is a good example—when it was open, the coffee shop had a large “Googie’s” sign on its exterior that drew in coffee drinkers. Recreate a diner’s neon welcome sign in your living room, or hang a poster of the famous Fabulous Las Vegas sign.